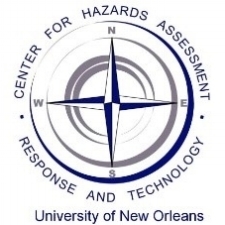 The University of New Orleans Center for Hazard Assessment, Response and Technology (UNO-CHART) is an applied social science research center that partners with and supports Louisiana communities in efforts to achieve disaster resilience. The objectives of UNO-CHART projects are to assist residents, local officials and state officials in reducing risk to natural hazards, especially hurricane and climate hazards, help them gain a better understanding of their risk, and identify actions they can take to protect themselves from these hazards. UNO-CHART was founded in 2001 as a Louisiana Board of Regents Approved Research Center. The center is comprised of a multi-disciplinary group of faculty, staff and graduate research assistants representing various academic backgrounds including sociology, political science, public administration, planning, urban studies, engineering and geography. Hazard mitigation is the center’s primary focus and applied research projects have addressed such topics as repetitive flooding, executive risk management, disaster mitigation planning, community resilience assessments, coastal storm mitigation efforts, coastal restoration planning, community continuity, risk management, and hurricane evacuation of vulnerable populations. The center’s approach to sustainability and resilience is based on building community and university partnerships grounded on the principals of: (1) community/organizational/engaged citizen collaborations and (2) building on community and scientific knowledge for both basic and applied research. Consequently, outreach is a major component of all UNO-CHART projects. Education and outreach initiatives include workshops, meeting facilitation, curriculum development, planning, flood loss analyses, risk assessments, and policy/program evaluation. The center’s projects also focus on partnership development with stakeholders. The outcomes of the center’s projects include ensuring that stakeholders have the information they need to make informed decisions for their homes, businesses, communities, etc. and to participate effectively in planning efforts for their communities. UNO-CHART’s researchers collaborate with similar organizations locally and across the country to promote sustainable and resilient strategies for risk reduction. Recent partners have included the Governor’s Office of Homeland Security and Emergency Preparedness (GOHSEP), Louisiana Coastal Protection & Restoration Authority (CPRA), LA DOTD, LSU AgCenter, Loyola University Literacy Center, FEMA, NOAA, University Corporation for Atmospheric Research (UCAR), National Science Foundation (NSF), Greater New Orleans Foundation, multiple parish governments, and community groups. With some projects, primary schools, faith-based organizations, and private businesses are also key partners for implementing programs. UNO-CHART is currently active in a number of initiatives in Louisiana. A few selected projects are described in the following paragraphs. Some of the center’s projects are focused on particular communities, while others have a broader target audience. A complete listing of current and past projects is available on UNO-CHART’s website here. The center’s major on-going statewide initiatives are the Louisiana Community Education & Outreach Program and the Cross Coastal Collaborative. Through the Louisiana Community Education & Outreach Program, UNO-CHART is implementing mitigation outreach and education projects intended to inform citizens, business owners, non-profit organizations, and local officials about the risks and their vulnerability to these risks, as well as ways in which those risks can be reduced through multiple mitigation methods. Additional information on this program is located under Louisiana Initiatives here. The Cross Coastal Collaborative project gathers academic scientists and members from 15 at-risk coastal, mostly indigenous, communities together as collaborators to explore sustainability issues and find ways of solving them through the development of a broader knowledge base. The languages of academic and community (i.e. traditional ecological knowledge) members are shared to the benefit of all parties. Then, continuing to use the same collaborative, respectful approach, a “tool” for use in coastal restoration projects will be developed for co-management by agencies, academics, government officials and citizens who are research collaborators in this project. UNO-CHART uses similar approaches toward collaborative problem-solving in their individual community-focused projects as well. Through the “Mitigation Funding and Homeowner Assistance” program, UNO-CHART is assisting Solutient, a private hazard mitigation consulting firm, in providing homeowner consultations regarding individual mitigation programs and related funding. This project currently serves residents of lower Jefferson Parish. Another on-going parish-specific project is the “Resident-Driven Action Planning for Community Resiliency in Plaquemines Parish.” In partnership with residents of Plaquemines Parish and the Greater New Orleans Foundation, the UNO-CHART project team utilizes Participatory Action Research (PAR) methods to work toward increased citizen involvement in the planning process for the Parish. The team works directly with residents to ensure that local knowledge and the community’s own vision are included in the multiple planning efforts that will have direct effects on Plaquemines Parish. UNO-CHART, in partnership with UCAR, has also brought in talented students from around the nation to engage in a participatory action research model (PAR) in ethnically diverse, at-risk, coastal communities in Southeast Louisiana through the “Significant Opportunities in Atmospheric Research and Science” (SOARS) summer research program. UNO-CHART engages in projects with a regional scope, with objectives relating to the needs of citizens from across the Gulf Coast. The initiative titled “Blending Science and Traditional Ecological Knowledge (TEK) to Support Ecosystem Restoration” is bringing together a team of UNO physical scientists, community representatives and social scientists from UNO-CHART to develop a social ‘tool’ to support Sci-TEK Collaborative Mapping. The project is carried out in partnerships with NOAA’s Cooperative Remote Sensing Science and Technology Center (NOAA-CREST), Mississippi/Alabama Sea Grant, and the Louisiana Office of Coastal Protection and Restoration Authority (CPRA) to address the problems of coastal erosion and find solutions for restoration. Through the “Repetitive Floodloss Reduction Project,” UNO-CHART and FEMA are working with communities across Louisiana and Texas to reduce their number of repetitive flood losses. UNO-CHART is creating a website with a web-based data portal, carrying out area analyses for communities, and engaging in education and outreach activities to support this objective. Another project focused on reducing flooding risks is the “Floodplain Management Policy & Program Evaluation” project with the Association of State Floodplain Managers (ASFPM). UNO-CHART and ASFPM assisted the Federal Interagency Floodplain Management Task Force to identify the impacts and barriers of federal programs and those policies and programs that promote and support sound floodplain management.